Visitors to Montreal still have time to see Une brèche en toute chose (“A Crack in Everything”), a multimedia art exhibit that pays tribute to the late Leonard Cohen. More than a year after his death, Montreal is still celebrating Leonard Cohen’s life. The poet, novelist, songwriter and singer is everywhere—from the Main Deli, where he enjoyed smoked meat in the second booth against the wall, to the Jewish Public Library, with which Cohen was affiliated. But one of the largest tributes began two years before Cohen’s death—at the Musée d’art contemporain de Montréal (MAC) as part of the city’s 375th anniversary celebration. It opened one year after his passing. The exhibit contains no artifacts belonging to Cohen; no fedoras, long black coats or guitars—only his olive-green Olivetti manual typewriter on which he composed his first novel. What there is, though, is more impressive: filmmakers, musicians, contemporary artists and their takes on how Cohen influenced society. The exhibit—which runs until April 9, 2018— titled Une brèche en toute chose(“A Crack in Everything”) features tribute pieces from filmmakers, musicians and contemporary artists. With Cohen’s blessing, and with his complete artistic output made available to them, curators John Zeppetelli and Victor Shiffman, compiled the museum’s most ambitious exhibition, commissioning 20 works from 40 artists representing 10 countries to bring a unique vision to Cohen’s effect on music and literature. Consider Berlin-based Candice Breitz’s offering: the life-sized projection of 18 ardent male fans aged 65 and older encircling the viewer as they sing, “I’m Your Man,” backed by the all-male Shaar Hashomayim Synagogue Choir (the synagogue Cohen attended throughout his life). 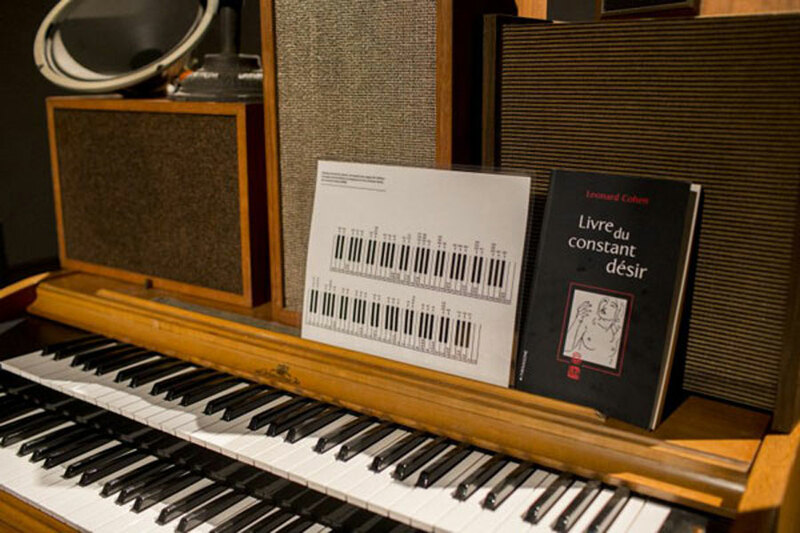 British Columbia-based Janet Cardiff and George Bures Miller pay homage to Book of Longing with an interactive sound installation called “The Poetry Machine.” Pressing a single key on the vintage Wurlitzer organ generates Cohen’s voice reading an excerpt from the book from one of the gramophone horns. Play more than one key, and the room is filled with Cohen’s voice reading several selections simultaneously. American Taryn Simon offers a mixed media installation of the front page of the New York Times, Friday, Nov. 11, 2016, with Cohen’s obituary published beneath a photograph of the first meeting between Barack Obama and President-elect Donald Trump. Cohen is doffing his hat in greeting or farewell. This entry was posted in ART, Canada, History, Music., Travel, World and tagged Leonard Cohen, Montreal, Music., Travel by rolyred. Bookmark the permalink.